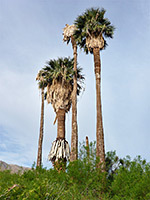 There are six oases with California fan palms (washingtonia filifera) in Joshua Tree National Park: Lost Palms, Cottonwood Spring, Munsen Canyon and Victory Palms in the south, Fortynine Palms and Oasis of Mara in the north. 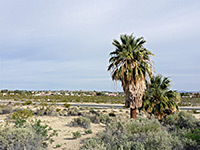 The latter is by far the easiest reached, since it is located right beside the main visitor center, near the north entrance to the park in Twentynine Palms. 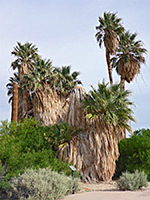 A paved, level, half mile loop path winds through the oasis, which contains one main group of palms, centered on a spring, and a few other trees nearby, not all living; one section has a somewhat forlorn appearance, with several dead trunks having lost their crowns, rising above piles of long-discarded leaves. 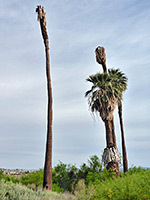 The surroundings are quite developed and a road runs close by to the north so the place is not so natural or atmospheric as the other oases, yet the surviving palms are healthy and there is plenty of other vegetation nearby, the most abundant species being honey mesquite. 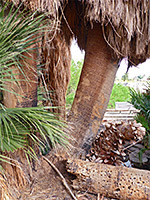 Mara, originally Marrah, is a word used by the native Serrano tribe, meaning 'place of little springs and much grass'; it was they who planted the palm trees here, several centuries ago. There were supposedly 29 of them, as a result of which the nearby town (established in the 1920s) was named. 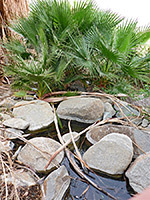 Earthquake activity associated with the Pinto Mountain Fault has reduced the water table in the vicinity and now the pools are maintained via a piped supply. 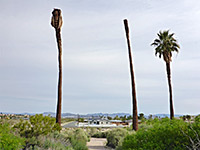 The trail starts from the rear of the visitor center, initially through a garden area which has a small collection of named plants, and then out into the natural desert, to a junction at the start of a loop, in front of the main palms - there are about ten large trees here, arranged around the pools of the spring. A few young trees at the base are enclosed by wire mesh for protection. Beyond are a few more palms as the path continues another 1,000 feet west then loops back on the far side. Some others lie just off-trail, close to the road. Away from the oasis the land is dusty and barren, with just a few cacti and a limited number of wildflowers. 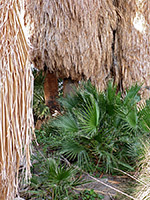 Notices along the way identify some of the bushes and other plants, and give information about the oasis.